All-new Zelda adventure also in the works. As we approach the 10-year anniversary of the U.S. release of The Legend of Zelda: The Wind Waker, you may be flush with nostalgia. 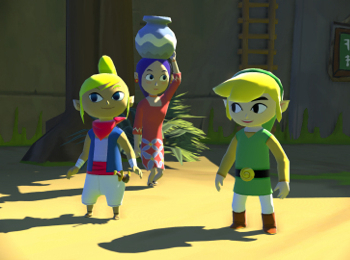 Nintendo is, too, and it's going to prove it by re-releasing Wind Waker this coming Fall for its new Wii U console. But we're not just talking about some blurry, 480p experience like you've played before. No, Nintendo has remade the entire game to be fit for today's HD sets, complete with updated textures and character models. Nintendo revealed the news in a Nintendo Direct live video stream earlier today, and offered the remake as a bit of a consolation gift after admitting that the next truly original Zelda title is still quite far away. No exact date, name, or real details regarding the new adventure were offered, simply that it exists, and it's going to be a while before we see it. The Wind Waker was met with nearly universal acclaim upon release, and it's still regarded as one of the finer Zelda titles ever released. An HD remake is intriguing, and the promised bonus feature of being able to play the game using just the Wii U gamepad is likely enough to make Zelda diehards squeal with delight. Of course, it would have been nice to see at least a glimpse of the all-new title being worked on, but at this point - and with the Wii U's limited library - we'll take what we can get.